FlatMode: Invasion from the East! LA has a lot of a lotta things...sunny days, beaches, cars, pollution, police helicopters...you know, the usual. However, lately we've had a lot flatland visitors! The following is a rundown of people who have made the trek to LA for a flatland session! Yo boy, Daisuke, from the far east....Osaka, Japan to be exact. We introduced Daisuke to American style of eating. This sandwich is bigger than him! Gabe Kadmiri and Stephen Hearne came out to enjoy some session time at the beach! Shayne Kajehnoori and Darin Wright came from Georgia for some sushi and a session! That's your boy, Richard Aguayo, on the far right entertaining the guests. The DUKE! Royalty graced us with his presence on his journey around the States and Canada. Travis Collier! Our man from the north has been here twice in the last two months! Check his video from Vancouver! 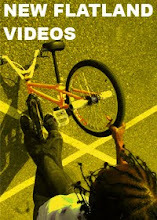 MACNEIL BMX COMMERCIAL - TRAVIS COLLIER AT NIGHT from MACNEIL BMX on Vimeo.